As the last week of March wraps up I am looking forward to warmer weather, spending more time outside, and of course NC Beer Month kicking off in April. There are several cool things going on this weekend. For more suggestions about upcoming NC Beer Month related activities check out my recent post here. If beer is not your thing I have several other suggestions for the weekend below. Hope you have a great weekend. Here’s to warmer temps! Jazz Trumpeter at Beyu Café in Durham Beyu Caffe is honored to present the city of Atlanta’s Jazz Hero of the national JJA Jazz Award, Danny Harper. Sure to be a fun evening of Jazz and good food & drink at Beyu. Located in the heart of downtown this is a great way to end an evening in Durham taking in some incredible jazz. 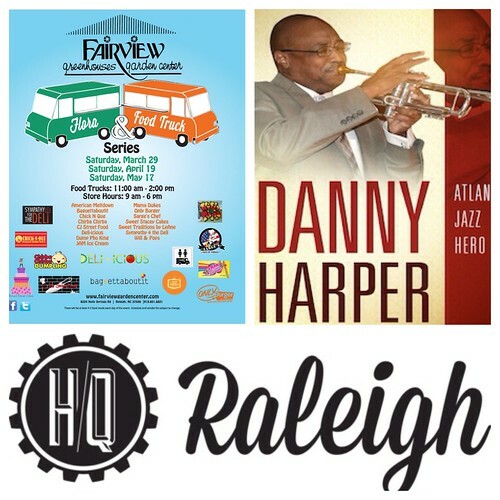 Mr Harper will play two sets (8pm and 10pm). Tickets are $12 per show or $20 to attend both. White Street Brewery in Wake Forest is having their first bottle release as part of their new “Back Alley Series”. This Russian imperial stout is aged in bourbon barrels and bottled in 750ML cork & caged bottles at 13% ABV. Bottle sales begin at 2pm in the taproom ($13.99 each). Samples available for $2. LoneRider is taking over Blount Street for another evening of great music, food and of course a ton of great beer. This is a ticketed event – follow the link for more details and ticket info. Serving Up Spring – A Pop-Up Brunch at HQ Raleigh Check out HQ Raleigh’s new space in downtown Raleigh and support a great cause! For $19 you can enjoy a PopUp brunch at HQ Raleigh this Sunday featuring crepes, chicken, pastries, coffee, a juice sampling from Raleigh Raw, and more delicious brunchy goodness! Each brunch ticket also includes free admission to to the Contemporary Art Museum, conveniently located right next door. Online registration required. Dine anytime between 10 AM and 2 PM. Proceeds benefit Activate Good’s Activate Schools program, empowering teens to lead and serve to make an impact. Tips humbly encouraged and contribute to funds raised. Register online at http://activategood.org/servingupspring. Picture of the Week – Functional Art! I grabbed this photo yesterday while visiting Tyler’s Taproom in Seaboard Station last night for the Raleigh Beer Guide Launch Party. Apparently this bike rack has been around for a while but it just caught my eye last night. 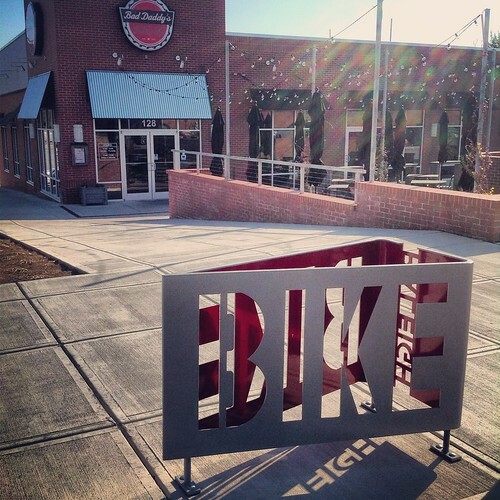 You may have noticed that recently there are some creative looking bike racks poppin up around downtown. This is one of my favorites so far. As you can see, it is located right in front of Bad Daddy’s Burger Bar. Moments after I took this shot somebody came up and locked their bike to it. Functional art. I like it!